Thank you to all the prayer partners in this Novena, thank you St.s, Holy Mother and God in Heaven for answering my prayer for a family member suffering with mental illness and a dear friend suffering daily with an incurable blood disease. Both have shown signs of strength this weak that have no other explanation but that of answered prayers. Praise our Lord Jesus. I trust in You. Please watch over Cassie, Barb, Dana, Sue, Kara, Gerriann, Cindy, and everyone else who I have missed. Please watch over Travis and his temper. Bless him in his new job. Let him fine his true love. Watch over Krystle and her new love. Please also fine someone for Missy to love and heal her pneumonia. We are looking for a house Lord please send one our way that we can afford that all 8 of us can live in peacefully. As I go to the Dr today please let them first day what is causing me to cough so much. Bless Chris in the extra jobs he is doing. St.Peregrine, .Thank you for hearing our requests. We pray for all whom are suffering with cancer, and whom had died from cancer. We pray,..Our Father who art in heaven. 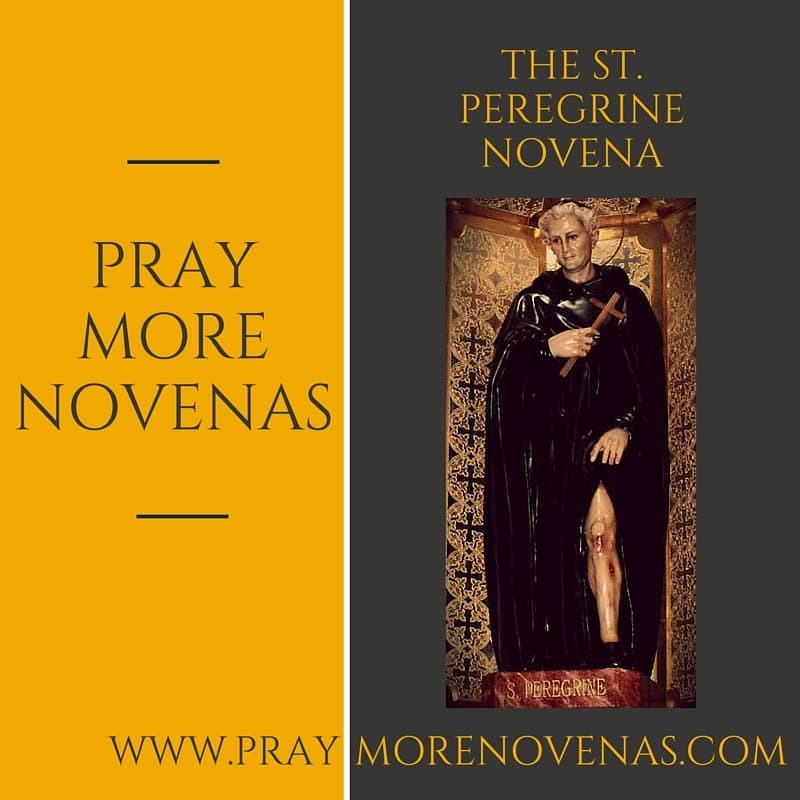 Glory be to the father, ..
Saint Peregrine, thank you for your intercession in the prayers of those participating in this novena. Please hear those of us whom have not received our answers, that we too may know God’s healing presence. Amen. Take this disease away. Thank ou for this healing taking care of me all God ‘s plan. Let me serve God with this healthy body. Thank you for God’s talented doctors. Bless all that pray for their life back. Pray for us, that the cancer of abortion will be healed in our land. Pray for us, that our suffering will not rob us of joy. Pray for us, that in our pain we will not become selfish but ever more selfless. Pray for us, that this sickness will teach us to depend more and more on God. Pray for us, that our lives will glorify God alone. Dear Lord we pray for all who are suffering from Cancer, heal them and bless them all.